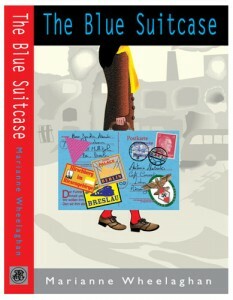 Food of Ghosts, is as far removed from The Blue Suitcase as it’s possible to get, and I admire Marianne Wheelaghan’s literary confidence in making such a leap. 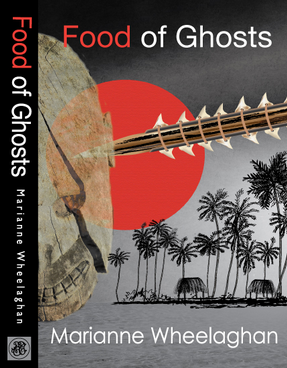 Food of Ghosts is a crime novel set on the sweltering Pacific island of Tarawa. With the current fashion for ‘tartan noir’ novels set in dark, Gothic Edinburgh or tough, gutsy Glasgow it was pleasing to find one set in this most unusual location. The novel tells the story of Detective Sergeant Louisa Townsend, who has left Edinburgh to take up a post on Tarawa, helping shake up the island police force. 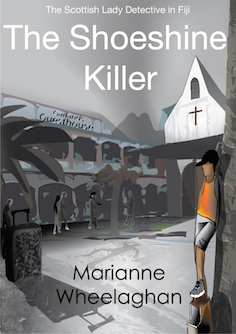 Amidst the glorious white beaches, blazing sun and waving palm trees, she soon finds herself dealing with some particularly gruesome murders, made all the more horrifying because they are occurring in this seemingly innocent island paradise. We feel Louisa’s frustration and impatience with the islanders who allow tradition and superstition to get in the way of her quick, practiced police methods.Meanwhile, the officers on Tarawa don’t take kindly to a woman, and an outsider, telling them how to operate. Louisa desperately needs to prove herself, to the islanders, and to her bosses, and struggles under the sweltering sun. Although the novel is a good read, and packed with luxurious description of the island, I feel it would have benefited a great deal from some back-story. We are told that Louisa was born on the island, so this explains why she may have applied for this unusual post, but how did her island upbringing shape her? Does she consider herself Tarawan or Scottish? What was her life in Edinburgh before she left? Was she fleeing something? We get hints that she has a strained relationship with her mother, and we are told she slept with her boss, which she regrets, but tell us more. Why has she fled half-way across the world? With both novels, the main word which sprang to my mind was ‘refreshing’. The first gives us a new perspective and the second gives us an unusual setting. Both are invigorating books and good reads which leave you keen to see where the author takes them next.